What if the characters in a vampire novel left their world - and came into yours? 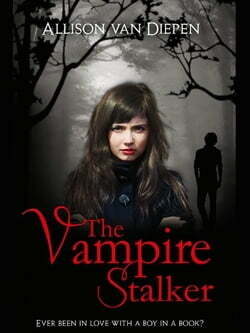 Amy is in love with someone who doesn't exist: Alexander Banks, the dashing hero in a popular series of vampire novels. Then one night, Amy meets a boy who bears an eerie resemblance to Alexander. In fact, he is... read more Alexander, who has escaped from the pages of the book and is in hot pursuit of a wicked vampire named Vigo. Together, Amy and Alexander set out to track Vigo and learn how and why Alexander crossed over. But when she and Alexander begin to fall for each other, Amy wonders if she even wants him to ever return to the realm of fiction.